Hi Annie, Welcome to Café Cala. It’s great to have you visit Café Cala. 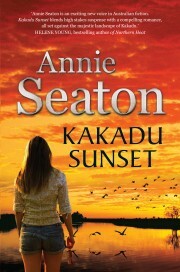 I really enjoyed reading Kakadu Sunset. I’ve been making shortbread from my grandmother’s recipe this morning. Would you like tea or coffee with yours? Hi Maggie…lovely to be here with you. I would love a cup of Earl Grey in a fine china cup please. 1 Where did you get the idea for Kakadu Sunset? Two years ago on the way to the Northern Territory, we crossed the vast outback through three states, travelling through ancient landscapes. Many of these landscapes have been scarred by various types of mining. So what is Kakadu Sunset about? After a career in education, and being at the beck and call of children, parents, staff and administrators, it is very satisfying to sit at my desk and work to my own deadlines…in absolute silence all day long. The most rewarding part is being able to tell the stories that are in my head and know that readers enjoy them and look forward to the next one. I’ve always wanted to write…from a very young age. I loved composition in primary school, many years ago. I wrote a little book when I was eleven and then after university, career, marriage and family filled my life. I retired (young) from a career in education and decided to try my hand at writing. It was now or never! I wrote my first novella, and had it accepted by a publisher a month later. I was fortunate to be picked up by a large US digital publisher with my second book (Holiday Affair) And it went on to become a best seller in the US and the UK. Since then I have written 22 books in four years. It’s that quiet and peaceful office that helps my productivity! The solidarity of the community of romance writers in Australia. The friendships I have made, talking about and honing my craft with likeminded people, the annual conference and just being a part of that writing community has been wonderful. I am immersed in the research and the early chapters of Book 3 on the Porter Sisters series: Kimberley Moonlight. Follow your dream. Persevere, be determined and if you can, devote structured time to your writing. Don’t talk about writing, do it and write! I have very wide reading tastes. At the moment, I am enjoying Kristan Higgins’ books. 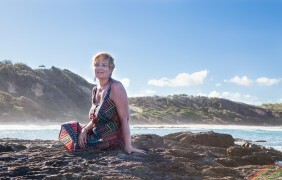 I love reading Australian authors: there are many I read but some of my favourites are Fiona McArthur, Helene Young, Bronwyn Parry, Susanne Bellamy and Trish Morey. Kakadu Sunset is now available from the following e-tailers and from all good Australian and New Zealand Book stores, and Big W and Target.